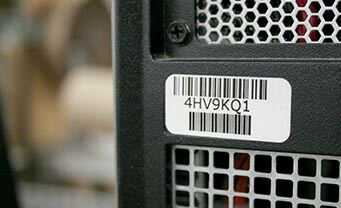 Need heavy-duty labels for harsh-use environments? 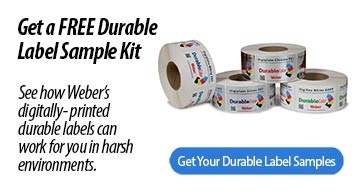 Weber's line of durable film label materials are specifically designed to maximize long term performance of labels on products that need heavy-duty labels that last. 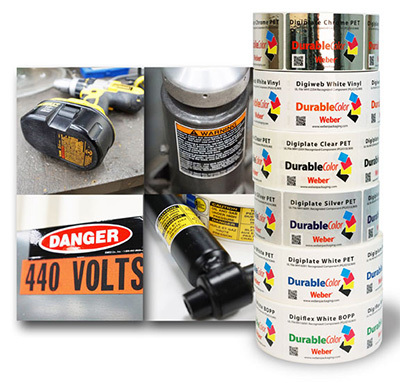 A durable label is intended to remain with a durable good throughout the product’s life and must withstand possible hostile environments such as exposures to chemicals, extreme temperatures, or UV light. Additionally, the label often must be recognized by UL as being a component itself of the durable good. Durable products, such as tools, automotive parts, warning signs, consumer electronics, industrial machinery and more need labels that will withstand repeated use, abuse and harsh weather. • Digiflex White BOPP, a UL-recognized economical polyproplyene material perfect for printing decorative graphics on sporting goods, warning labels, medical device labels, instruction labels and more..
• Digiweb White Vinyl, a UL-recognized material with excellent conformability to curved surfaces. Works well for graphic display POP decals, warehouse shelf bin labels, and more. • Digiplate PET, a UL-recognized polyester film material (available in white, silver or chrome) that is suitable for flat industrial surfaces. Best suited for warning labels, instruction labels, medical device labels, sporting equipment labels and more. All durable labels come with a clear gloss overlaminate for ultimate label protection. What goes into a Weber Durable Digital label? • Use bright colors when creating warning labels to make sure they are seen. • After printing the durable labels, we cover them with our PET over laminate film to achieve a long-lasting, durable lifespan. • Weber can print low volumes of just 500 labels when using digital printing and our new durable digital materials.